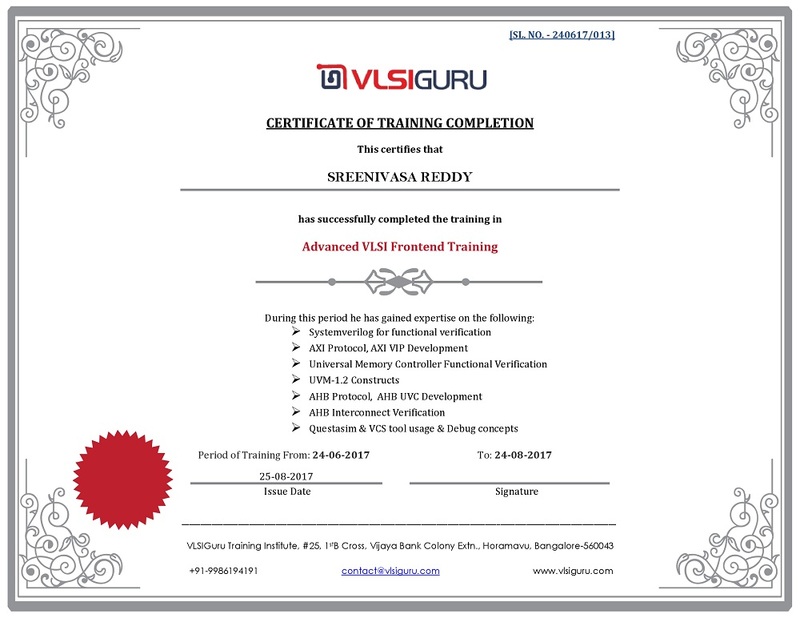 VLSI Front end training for Experienced Engineers (VG-FEDV) course is a 17 weeks course structured to enable experienced engineers gain expertise in functional verification. Majority cases, engineers does not get the hands on exposure to SV & UVM based testbench development, most of times goes in testcase coding and debug, leaving with very minimal SV & UVM expertise. This course is targeted for such engineers, to enable them get hands on exposure to complete Testbench development using SV & UVM. Training includes more than 40+ assignments covering various aspects of Systemverilog, AXI Protocol, AXI VIP Development, Memory Controller verification, UVM constructs, AHB Protocol, AHB UVC Development and AHB Interconnect functional verification. All the aspects of the course are covered using practical examples. Systemverilog training involves more than 250+ examples covering all the aspects of Systemverilog. UVM training involves more than 100+ examples. All the examples and projects are developed from scratch as part of training sessions. 40+ detailed assignments covering all aspects of SV & UVM. AHB Interconnect is a design with configurable number of masters and slave interface. Design routes the AHB transactions at master interfaces to corresponding slaves. I was responsible for setting up configurable TB using SV & UVM for interconnect verification. I have also developed testcases and sequences for verifying various design features. Is it possible to cover so many things in 17 weeks? 12+ years of rich experience of working in Functional Verification domain across various mobile, networking, high speed peripheral domains.